Two Cecil College engineering students are spending their summer helping operators at Cecil County’s newest power generation facility prepare for its launch later this year. The college has partnered with local businesses, including Old Dominion Electric Cooperative’s Wildcat Point Generation Facility in Conowingo where Elizabeth Hikins and Tyler Bishop landed full-time, paid internships. The plant, with an estimated cost of three-quarters of a billion dollars, will provide electricity for member cooperatives that include Choptank Electric in Maryland and Delaware Electric Co-op, Greenville. 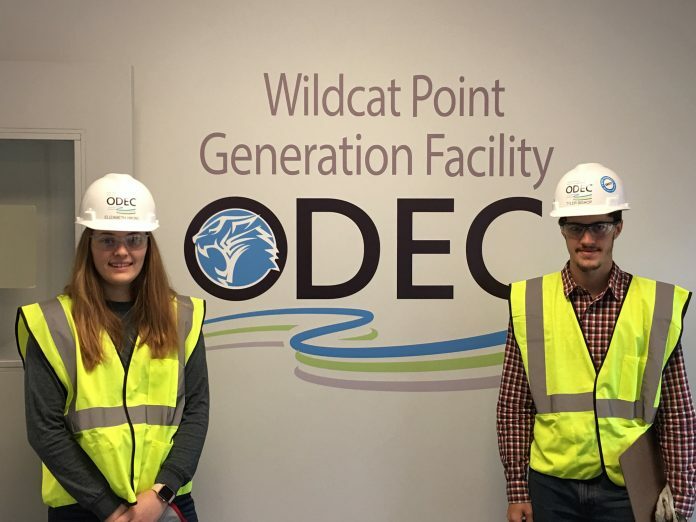 Hikins, a Bohemia Manor High School graduate, and Bishop, who came to Cecil College by way of Oxford High School in Pennsylvania, started their internships with ODEC in May and immediately saw how their classroom studies related to the plant’s operation. “I’ve already gotten so much out of it,” Hikins said. “There are so many examples of physics around the plant, especially thermodynamics.” Bishop said he had the opportunity to participate in water testing with the plant chemist and noted that his lab work at Cecil helped him better understand the process. According to Hikins and Bishop’s supervisors, the students have made positive impressions on their managers and co-workers as well. Jeff Shute, Wildcat Point Generation Facility operations manager, praised Hikins’ eagerness to take on new tasks and her ability to apply what she is learning at Cecil to her duties at the plant. Hikins attributes part of her success to Cecil College physics, engineering and geosciences professor Gail Wyant for preparing her for this opportunity. Likewise, Bishop said working with Cecil’s student life coordinator, Lisa Reynolds, and vice president of community relations and college advancement, Chris Ann Szep, during his time on the college’s Student Leadership Council has helped him become a more outgoing person. After Hikins’ shift at ODEC, she fills her evenings by attending class three nights a week and working part time at Applebee’s in Newark. She is also a member of the college’s Robotics Club and participates in weekly club events. Upon graduation from Cecil, both students plan to transfer to four-year institutions to continue their education.